A thermocouple is a temperature-measuring device consisting of two dissimilar conductors that contact each other at one or more spots, where a temperature differential is experienced by the different conductors. 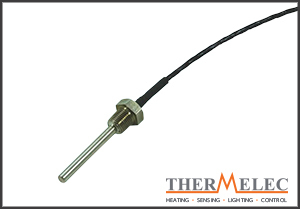 We supply a wide array of thermocouples, Type J, K, T to name but a few here at Thermelec, each one custom made to your needs, this can be as simple as a process connection, material construction or even an electrical connection that can interface with an existing equipment. We offer specialist process connection such as flanges, bayonet, hygienic and the simple thread. The thermocouples can be made from a variety of stainless steel, PTFE, Aluminium to name a few. We can supply a number of electrical outputs and electrical connections to meet your requirements and offer a calibration service too. 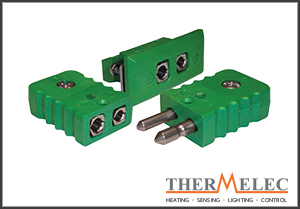 RTD’s are sensors used to measure temperature by relating the resistance of the RTD element with the temperature. A Pt100 is a device with a typical resistance of 100 Ω at 0°C. It changes resistance value as its temperature changes following a positive slope (resistance increases when temperature is increasing. RTD’s can be made from a variety of pure materials, most notably platinum, nickel or copper and it is this material that has a predictable change in resistance when the temperature changes. Our RTD’s are accurate, repeatable and interchangeable over a wide operating range and can be supplied with a plain stem, fixed process connection and terminal heads. Here at Thermelec we offer both Watlow and our very own range. 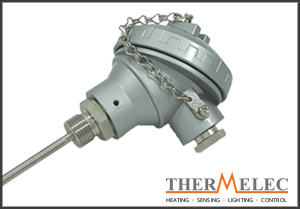 Here at Thermelec we are able to offer a multitude of accessories to fit your temperature measurement needs. These include; Thermocouple cable, high temperature signal cables, compression fittings, thermocouple connectors, thermowells, pockets and temperature transmitters.